The Jungheinrich EZS 010 is a versatile, economic mini tow tractor for pulling up to 1000 kg trailers. Ideal for moving loads in restricted areas. Instead of time-consuming and energy-sapping manual work, trailers can now be moved faster, more efficiently and more easily. Designed for a wide range of applications, such as furniture wholesale, industry, supermarkets or hospitals. Anywhere where smaller loads must be transported over short distances, the EZS 010 is the clear choice with compelling advantages. Wide variety of coupling systems for many different trailer types. Clearly visible, easily accessible coupling. 24-volt 3-phase AC drive motor. Drive tyre protected by chassis. A choice of three travel programmes. Combined discharge indicator (3 colour LED) with load status display. CanDis (optional) provides information on battery charge status, service hours and error codes. PIN activation of truck and choice of 3 travel programmes via keypad (optional). Adjustable drive parameters via Can-Dis and CanCode (optional). Colour coding and buttons with countersunk/raised shape for intuitive operation. 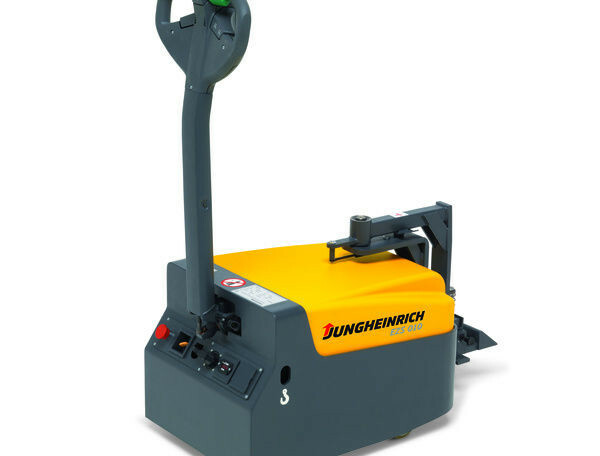 Grip position ideally suited to the operator's hand posture. Crawl speed button underneath the tiller arm for easy access and travelling with the tiller upright. High protection level of Electric Controller to IP 65 giving low risk of breakdown. Rocker switches for equally good operation in any tiller position. Maintenance-free 3 Phase drive motor with no carbon brushes. Easy access to all parts inside one-piece front panel with just 2 Retaining fasteners. Excellent protection against dust and humidity through enclosure of controller and plugs to IP 54. The battery can be recharged at any mains socket using the built-in charger. Individual coupling solutions enable the truck to be used with a range of trailer types. Both standard couplings (e.g. single plug couplings) and modified couplings can be used. Standard couplings attached to the chassis if the trailer has its own steering. Coupling arm can be used with a modified receptacle for non-self steering trailers. This ensures easy steering and effortless direction of trailers.